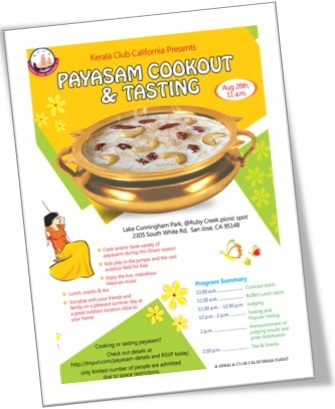 On August 28, 2010, Lake Cunningham Park in San Jose, CA witnessed an amazing and one of a kind event where over a hundred Malayalees participated. It was Kerala Club's "Payasam Cookoff" where 20 teams prepared various kinds of payasam-s. All who attended this event were the judges! They judged the most popular payasam, while a handful of invited judges - Mr. Meppallil Shandas, Mrs. Padma Shandas, Mr. Venu Varma, Mr. Anandakuttan - tasted and selected the best three payasam-s.
Kerala Club also arranged an inflated jumperat the event so our very young participants also would have an enjoyable day. At this picnic like setting, food was made available to all by Peacock Indian Restaurant at a highly discounted price. Kerala Club thanks them for the excellent food and commitment to our community. Pictures from this event can be found at this link. Recipes for all payasam verieties available! We are glad to share with you recipes for all the payasam-s prepared at the cookoff, including the award-winning "Idichu Pizhinja Paayasam", "Wheat Payasam", "Rice and cherupayar-parippu payasam" and "Payasa Raaja!" are available at this link.